This collection of compositions is for the open/closed glottis, high register, melodic technique of jaw harp playing, as can be found in the traditional musics of Norway, Kyrgyzstan, Sicily, Estonia, and Rajasthan. In Russian and English. включает в себя перевод на русский язык. 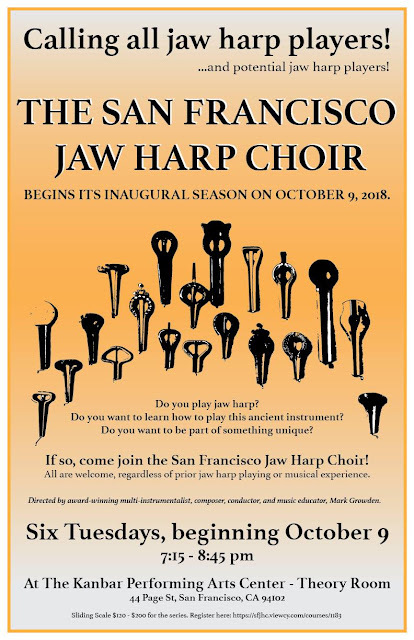 Structured like a community chorus, all are welcome to join, regardless of prior jaw harp playing experience. We’ll teach you how to play! Don’t own a jaw harp? No worries. We have inexpensive mouth harps available for purchase and an instrument library from which , you can borrow with a small deposit. Our goal is to develop a body of work that we can record and perform at regional venues and jaw harp festivals near and afar. The Jaw Harp Choir will be led by award-winning multi-instrumentalist, composer, conductor, and music educator, Mark Growden. 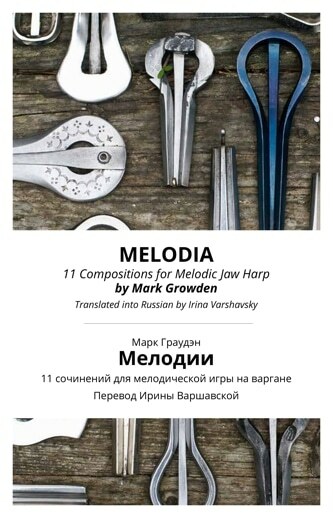 Mark has been playing jaw harp since the mid-seventies and recently authored the book Melodia - 11 Compositions for The Melodic Jaw Harp. Mark has extensive experience as a music director and music educator. publication of the newsletter is not quite weekly at this point; please expect a new edition only once or twice per month. please visit and like #KhomusWeekly on Facebook! your submissions are appreciated - please share your announcements, favorite articles, photos and videos of this fascinating World of the Khomus! tweet URLs using #KhomusWeekly and your announcements, favorite articles, photos, and videos can automatically appear in the newsletter! there are loads of videos for your enjoyment on the #KhomusWeekly YouTube Channel!